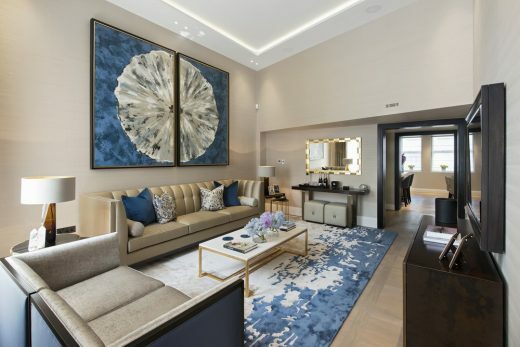 Amazon Property are undertaking the main launch of The Park Crescent, London’s only Royal crescent, designed by renowned architect John Nash (1752-1835), transformed to provide 20 two to four bedroom ultra prime residences. The development includes lateral, mezzanine and duplex apartments with 5-star hotel style concierge, fronting onto eight acres of magnificent private resident’s gardens and the 410 acres of Regent’s Park. Amazon Property observe that the world’s finest homes are set apart by their provenance, uniqueness, quality and location. London has many streets and avenues, a small collection of squares and just a few crescents; yet it has only one Royal crescent: The Park Crescent. 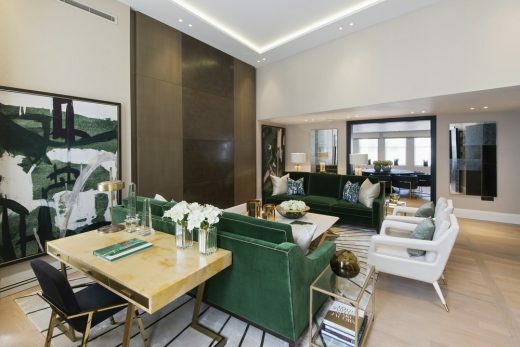 This absolute rareity sets this residential development clearly apart from any other. 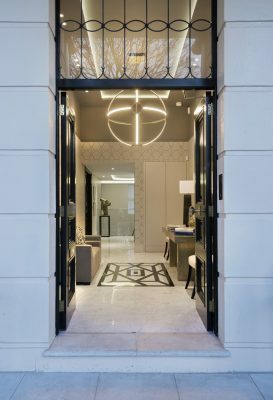 The Park Crescent traces its Royal origins back to 1811 when Prince George, Prince of Wales, was made Prince Regent and Acting Head of State due to the illness of his father King George III. The Prince Regent wanted his own palace and commissioned John Nash to create a master plan for a Royal residence, surrounded by parkland, complete with a circus of grand townhouses providing palatial homes for the family and friends of the Regent, located on the Crown Estate lands of Regent’s Park (originally the hunting chase of King Henry VIII). The Prince Regent felt that his family and friends would want their homes looking directly onto the parkland and his palace so the final design was for a grand Royal crescent with cream stucco façade and tall sash windows, overlooking private gardens and the park. The Royal crescent was built by Henry Peto between 1812-1820. 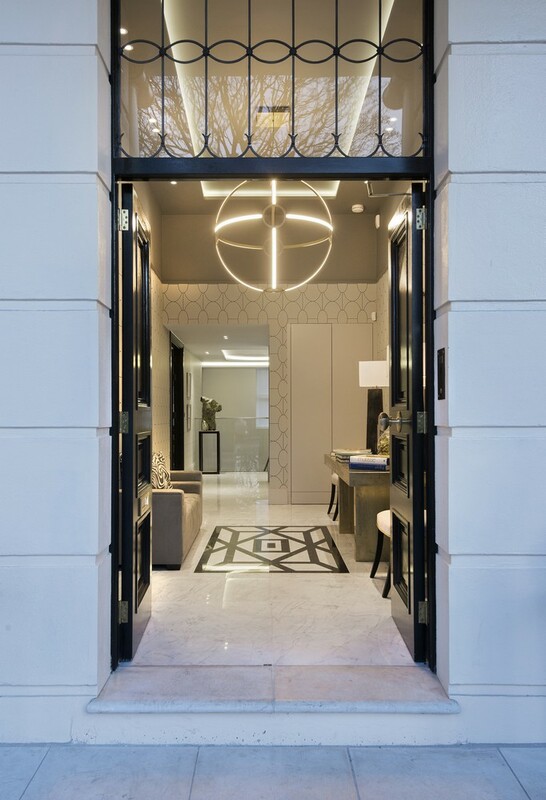 In 1820, the Prince Regent became King George IV and moved into Buckingham Palace, so his planned Regent’s palace was shelved; however the Royal crescent was completed and now as The Park Crescent forms one of London’s finest residential developments. The completed Royal crescent immediately became London’s most sought after address, home to exiled Royals, aristocrats, Ambassadors, business tycoons and high society. Residents included Lord Joseph Lister, pioneer of antiseptic surgery, who lived there in the 1830s; General Sir George Ashe, Commander of the British Bengal Army, who lived there between 1820-1832; Count Joseph-Napoleon Bonaparte and family (brother of French Emperor Napoleon Bonaparte) who lived there between 1832-1840; actress Dame Marie Tempest, lived there between 1899-1902 and Sir Charles Wheatstone, inventor of the electric telegraph, who lived there between 1850-75. One of London’s prestigious Blue Plaques on the façade of The Park Crescent highlights that it was also the home of Charles Francis Adams, Abraham Lincoln’s American Ambassador to London (son of US President John Quincy Adams) who lived there from 1863 to 1866. During this time part of the Royal crescent served as the US Ambassador’s official residence. Charles Adams returned to the US in 1869, but the family continued to use the Royal crescent as home and Charle’s son, the US historian Henry Brooks Adams, used the property as his London residence between 1878 – 1908. Between 1918 and the 1930s many of the crescent’s townhouses were converted into apartments. 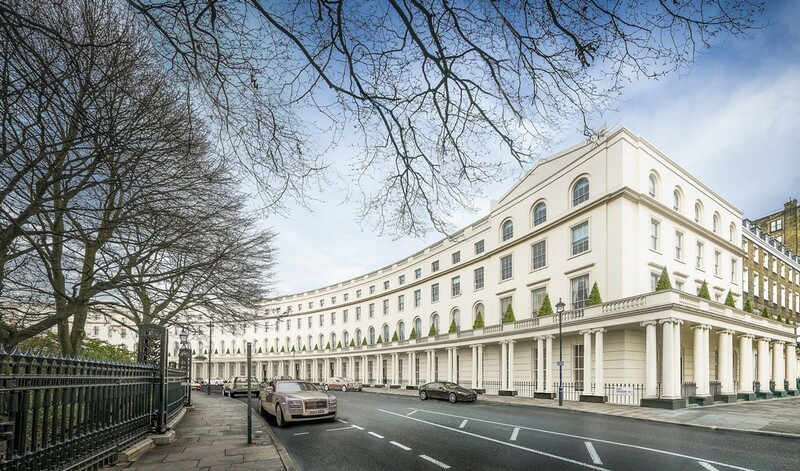 During WWII the crescent was damaged during the Blitz, but was carefully restored and rebuilt during the 1960s to exactly mirror the original Nash design. During the latter half of the 20th century, many of the properties in the crescent became office premises. Then in 2013, Amazon Property purchased The Park Crescent and had the exciting and bold vision to carefully convert and meticulously restore the Royal crescent back into its original role as one of London’s most prestigious residential addresses. 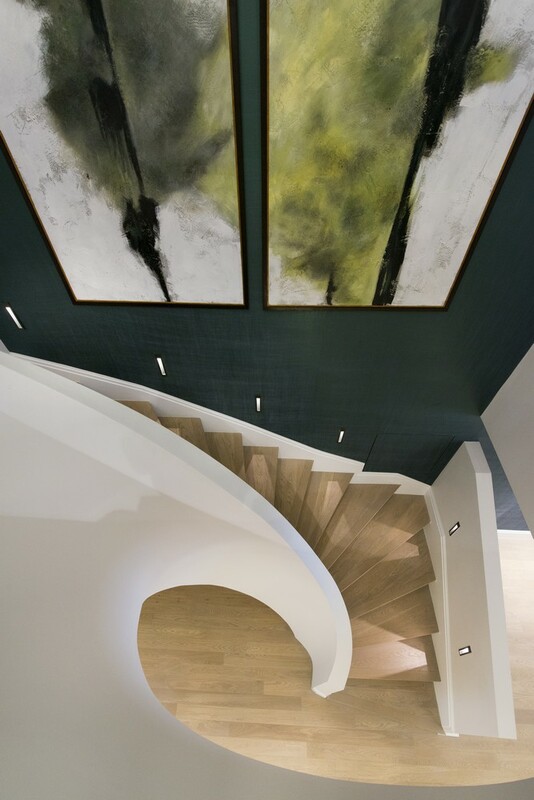 Due to the historically important, iconic and rare Nash architecture the restoration of the Royal crescent has taken several years of careful planning and highly skilled construction and restoration work to materialise. It has required outstanding craftsmanship, fine attention to detail and materials of the finest quality, sourced from around the world. 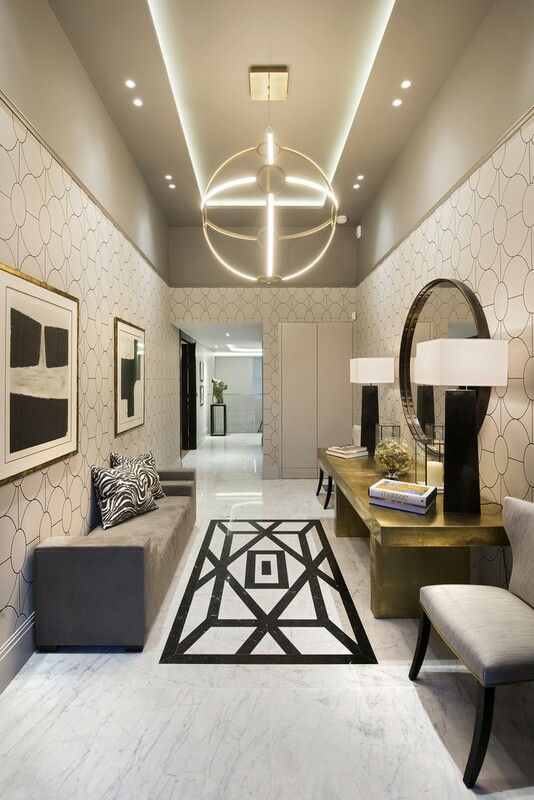 Behind the building’s retained classical Nash facade, newly built residences have been created which combine illustrious history with large lateral living spaces, generous ceiling heights and state of the art specification and technology. Each residence within The Park Crescent has its own character and distinctive features, ranging from 1,429 sqft (133 sqm) up to 4,127 sqft (383 sqm) in size with ceilings up to 3.8 metres high. Each apartment has spacious double or triple volume reception room overlooking the private gardens & Regent’s Park. 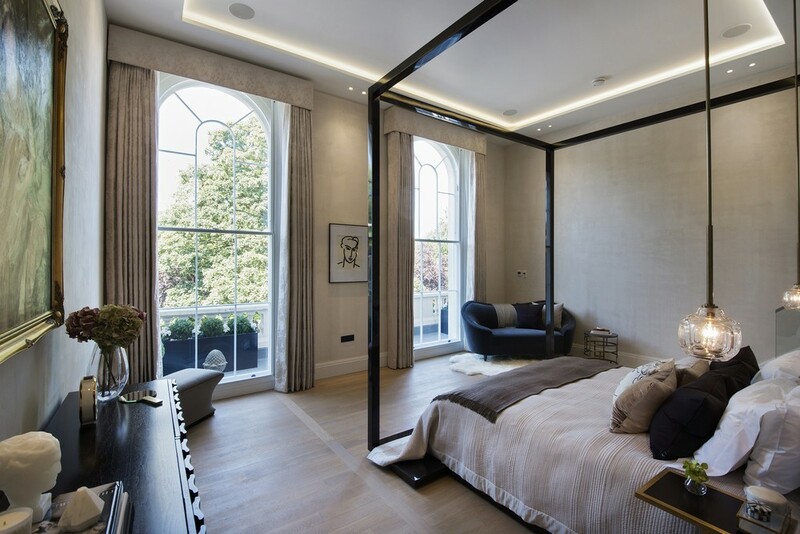 Features include full height doors, sash windows, generous ceiling heights and solid Oak flooring laid in bespoke designs. The individually designed handmade kitchens have Calacatta Michelangelo marble and granite worktops and panels, high gloss lacquered Oak soft close cupboards and drawers and a full range of integrated appliances. 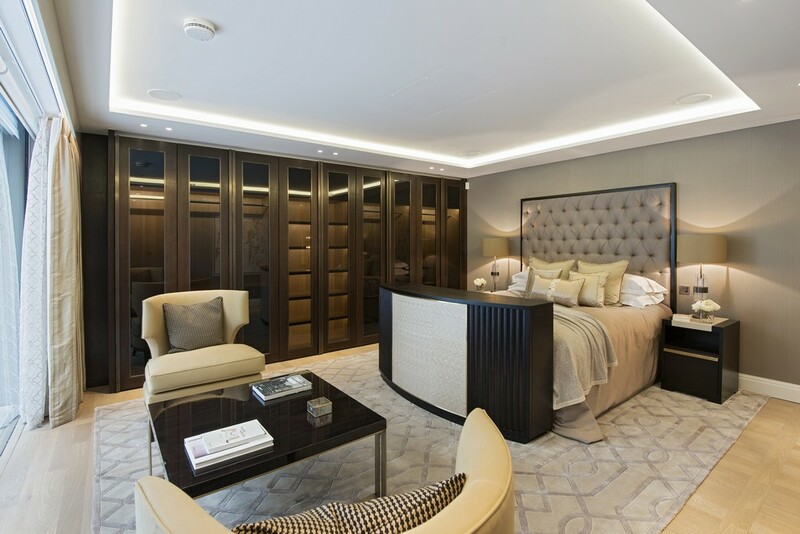 The master bedroom suites have spacious interiors; walk in dressing rooms with bespoke joinery and finishes, and luxurious ensuite bathrooms. 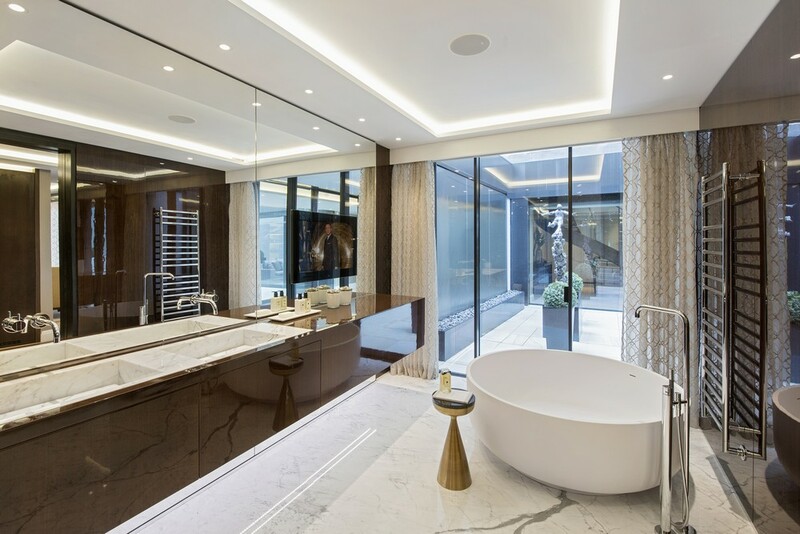 Master bathroom features include Calacatta Michelangelo and Maron stone flooring and walls, lacquered Oak veneer panelling, bespoke marble double basins and fitted mirrored cabinets. 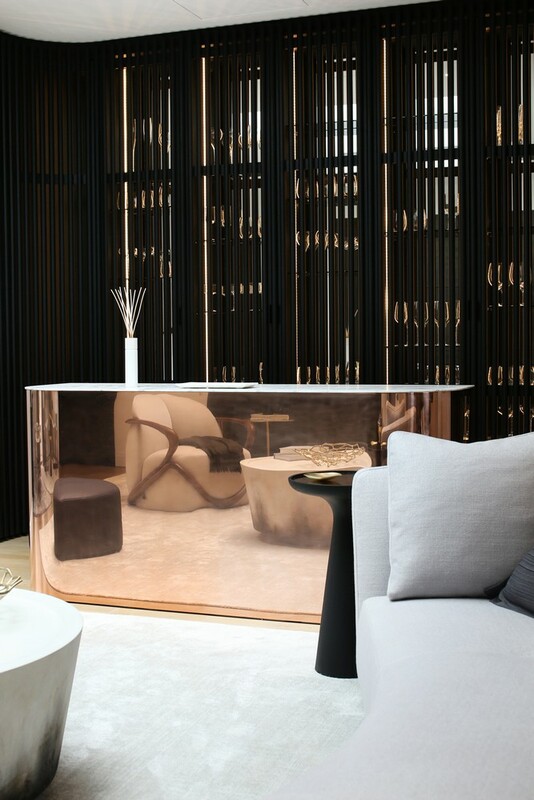 There are free standing sculptural baths, walk in marble showers and polished chrome heated towel rails. 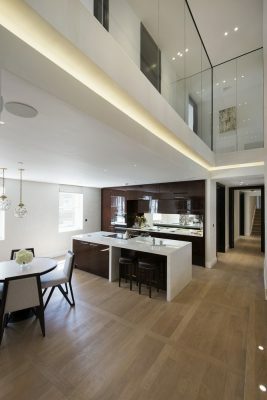 Other apartment features include coffered ceilings with concealed lighting, stone entrance lobbies, under floor heating throughout, comfort cooling to living rooms and bedrooms and state-of-the-art security and Lutron home entertainment systems.The mezzanine and duplex residences provide some of the layout benefits of a house, with bedroom suites on one level and entertaining areas on the other. 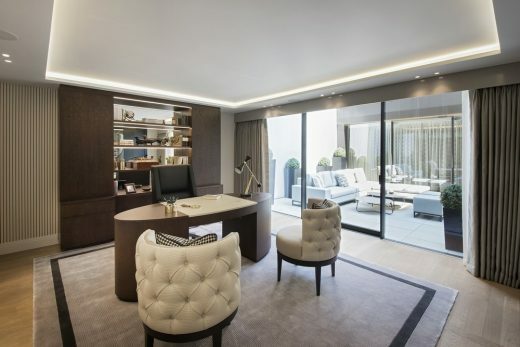 The Park Crescent residents will experience a world class concierge service and benefit from a 24 hour management service. Services include doormen, concierge for taxi/car hire, restaurant/theatre bookings, shopping delivery/services, dry cleaning/tailoring and car valet/servicing. Other facilities include access to a fleet of professional domestic staff providing services such as housekeeping, butler service, chauffeur and maintenance staff on hand 24/7. 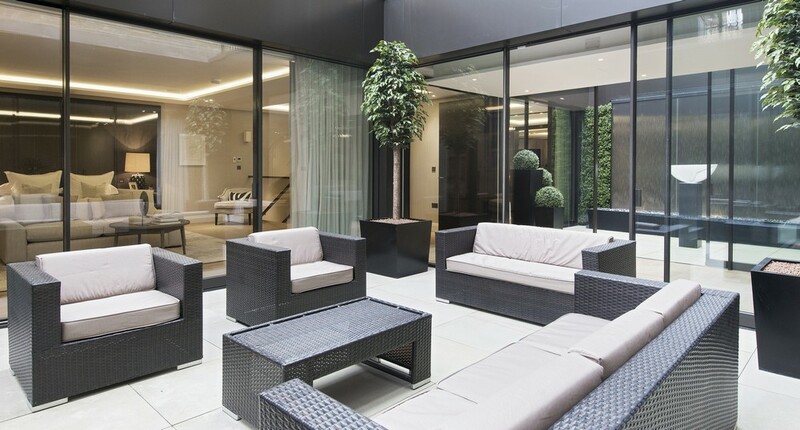 The Park Crescent residents have direct views onto and access to their own eight acres of magnificent private resident’s only gardens. Known as Park Square and Park Crescent Gardens they form two of the grandest gardens in central London. Laid out by John Nash between 1811 and 1827, the sweeping lawns, gravel pathways, loggia, plantings and summer tennis court were designed to echo the gardens of Buckingham Palace. The plane trees in the gardens, planted in 1817, were to commemorate the allied victory at Waterloo two years earlier (what the exiled Bonaparte family who lived in the Royal crescent thought of this has not been recorded). 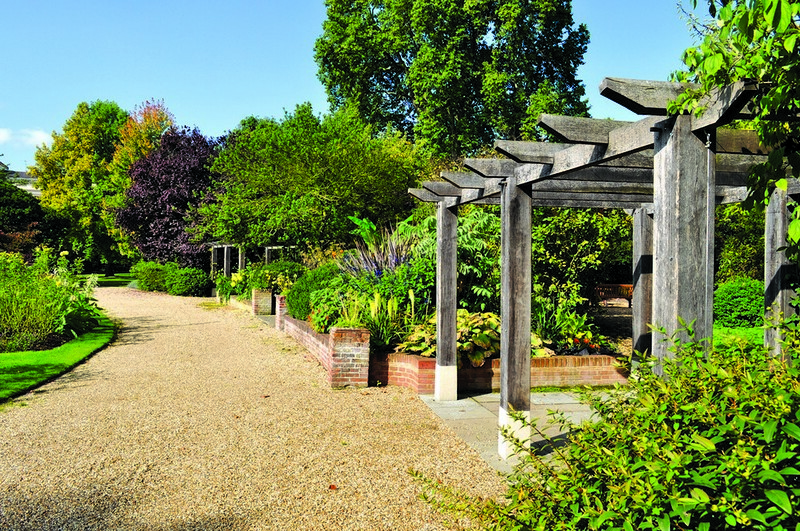 The two gardens are connected by the Nursemaid’s Tunnel, a pedestrian underpass that connects them and allows families to promenade safely and directly through both gardens. The gardens contain a statue overlooking the Royal crescent that is by Sebastian Gahagan and is of Queen Victoria’s father – HRH Prince Edward, Duke of Kent & Strathearn – which was installed in 1824. The first phase release of The Park Crescent was successfully sold, most off plan, using marketing material and computer generated images. 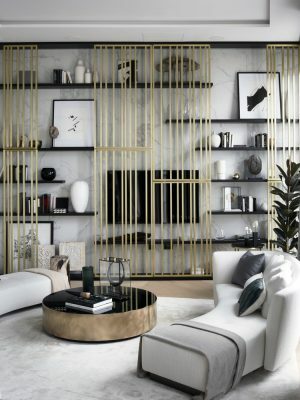 Now this highly anticipated project is nearing build completion and Amazon Property are undertaking the main launch of The Park Crescent, which will take place around a VIP launch event on the 6th October 2016, in conjunction with the world-renowned Frieze London Art Exhibition. 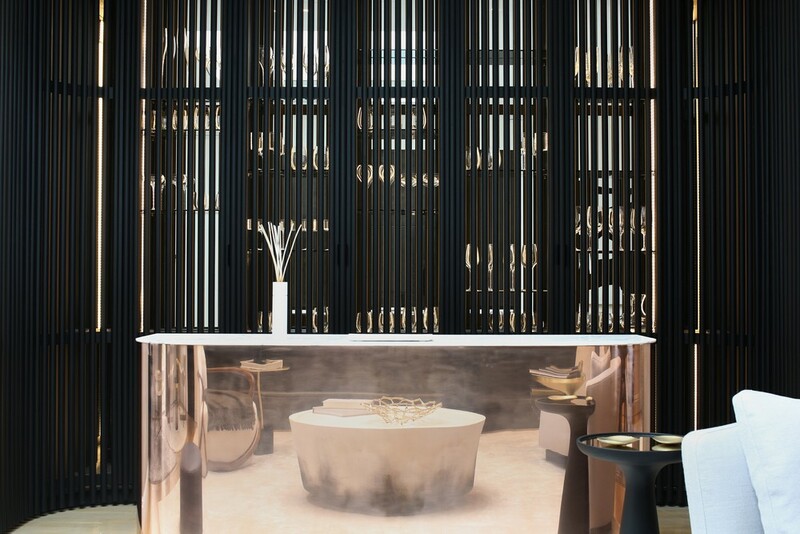 The centrepiece of the main launch will be a new previously unseen flagship four bedroom show residence, created and designed by award winning design luxury design house 1508, whose team is formed from designers from design-led brands Candy & Candy, Heatherwick and Clapham Taylor. 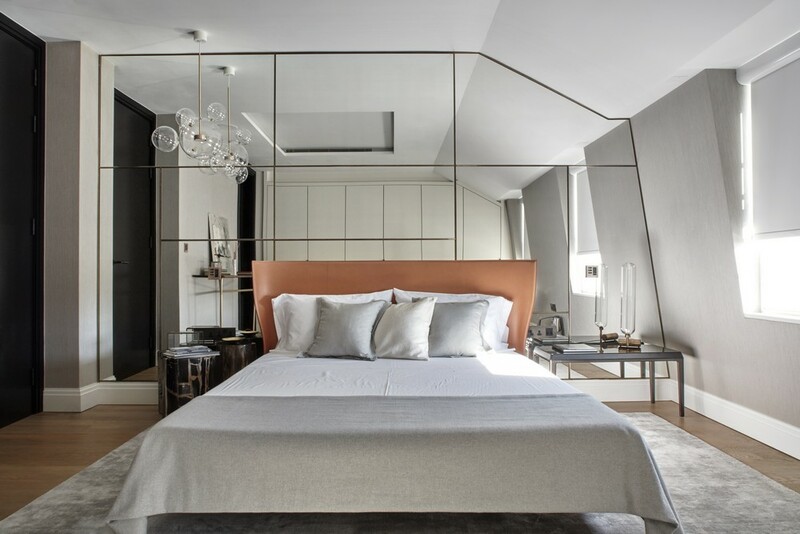 Alongside this, the main launch will showcase other previously unseen residences dressed by design houses Oliver Burns, DH Liberty and Taylor Howes. The lateral apartments at The Park Crescent are available for immediate occupation, prices at start from £3,950,000 (new 150 year leases). Along with Buckingham Palace and the Brighton Pavilion, the Royal Crescent overlooking Regent’s Park played a central role in the architectural career and enduring fame of John Nash. John Nash (1752 – 1835) was born in Lambeth, the son of a Welsh millwright. From young he displayed a skill for drawing, and between 1766 to 1776 he trained as an architect under Sir Robert Taylor. In 1777 he established his own architectural practice and early projects included a house in Bloomsbury Square and a church in Carmathen. 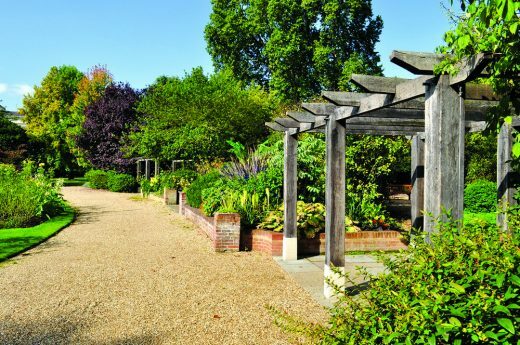 In 1792 he met landscaped designer Humphrey Repton and the two worked together on several grand country house estates with, in each case, Nash designing the main country house and Repton designing the gardens and landscaping. From 1796 Nash decided he wanted to focus on building houses in London and in 1797 he opened architect studios for his company on Dover Street in Mayfair. His focus on London led to the ending of his country house partnership with Repton in 1800. In 1798 Nash married the extremely pretty and much admired 25 year old socialite Mary Anne Bradley who was to play a central role in his future career. One of Nash’s country house clients was Charles James Fox, Leader of the House of Commons and later Secretary of State. Fox was a close friend and ally of Prince George, the Prince of Wales, playing a key role in Prince George being appointed as Prince Regent and Acting Head of State due to the illness of his father King George III. Thanks to Charles James Fox’s recommendation to Prince George in 1806 Nash was appointed as architect to the Surveyor General of Royal Parks and Chases; effectively architect to the Royal Household. For the rest of his career Nash would largely work for the Prince and Royal family and would take on very few private commissions. In 1811 Prince George was made Prince Regent and Acting Head of State and he decided that he wanted his own summer palace. He commissioned John Nash to create a masterplan for a Royal palace, surrounded by parkland, complete with a circus of grand townhouses providing palatial homes for the family and friends of the Regent. 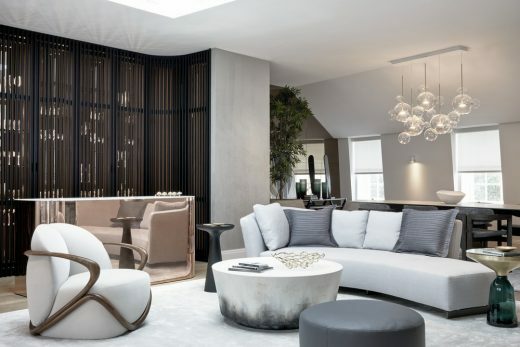 The new luxury development was located on the Crown Estate lands known as Marylebone Park (then renamed The Regent’s Park), which was originally the hunting chase of King Henry VIII. The Prince Regent was delighted by the plans calling The Regent’s Park and its Royal crescent the ‘jewel in the crown’ of London and saying in 1811 that ‘Nash’s plans for London will quite eclipse Napoleon’. Gossips and rivals of Nash said that he was only made Architect to the Royal Household and given the new Royal Palace commission because his pretty 25 year old wife Mary Anne had caught the eye of the Prince Regent and had become his secret mistress. Whether it was because the commission was for his own Palace or because Mary Anne was his secret mistress, the Prince Regent constantly reviewed and interfered in Nash’s plans for the Royal palace and the circus of townhouses. The Prince Regent felt that his family and friends would want their homes looking directly onto the parkland and his palace so the final design was for a grand Royal crescent with cream stucco façade and tall sash windows, overlooking private gardens and the park. 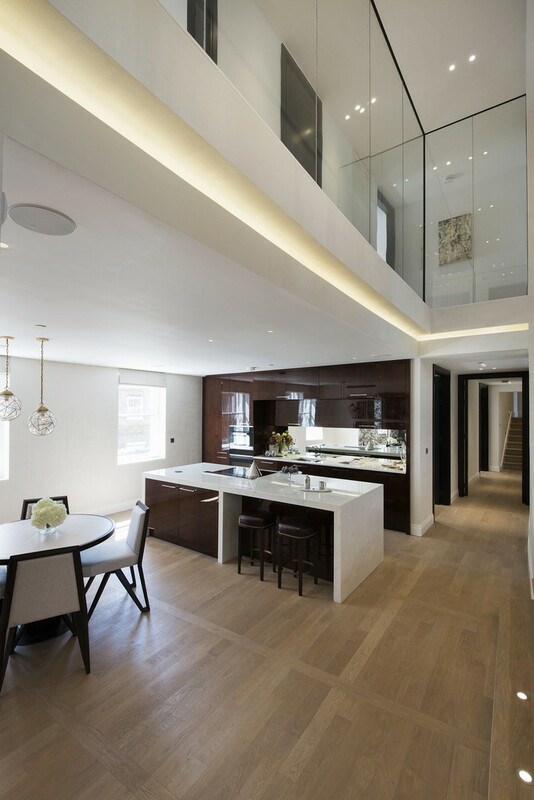 Under the Prince Regent’s constant interference and changes the Royal crescent homes became larger, grander and more opulent, resulting in significant over-runs to the original budgets and delays to the designs and build programme. 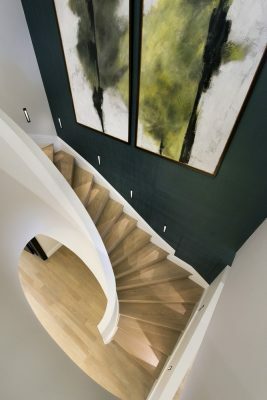 The final design was for a grand ceremonial route from St James’s Park in the south to Regent’s Park in the north creating a new thoroughfare through the heart of London. 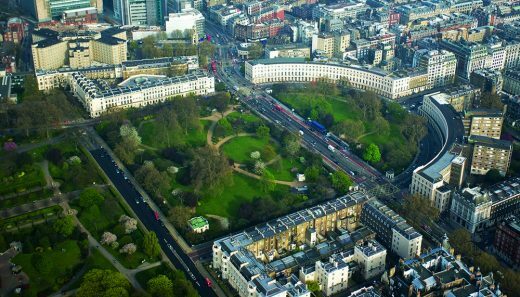 There was a new Royal Mall running from Buckingham Palace through St James’s Park; linking to a grand new boulevard (now Regent’s Street), connecting to a wide tree lined two lane carriageway (now Portland Place) which provided a dramatic approach to the new Royal crescent and Regent’s Park. The Royal crescent was built by Henry Peto between 1812-1820. However the new Palace in Regent’s Park was never built because in 1820 the Prince Regent became King George IV and moved into Buckingham Palace, so his planned Regent’s palace was shelved. In 1820 a scandal broke when a cartoon was published showing a half dressed King George IV embracing Nash’s wife with a speech bubble coming from the King’s mouth containing the words “I have great pleasure in visiting this part of my dominions”. London’s high society took to calling Nash’s wife ‘Mrs Prince’ and Nash was publically humiliated, but the King laughed off the scandal and the Royal household compensated Nash by giving him more work commissions. Nash was by now highly favoured by the Royal family. He had been commissioned to build a summer seaside palace – The Royal Pavilion – in Brighton, and he was commissioned to remodel Buckingham House to create Buckingham Palace (1825 – 1830), the Royal Mews (1822 – 1824) and Marble Arch (1828). In 1830 King George IV died and Nash’s career took a deep and sudden downward turn. The King’s notorious extravagance and expensive building projects had generated much resentment with Parliament and Nash was now without his Royal protector. The Treasury started to look closely at the costs and budget over-runs of the Royal Crescent in Regent’s Park, the Royal Pavilion in Brighton and Buckingham Palace. It was also discovered that the state coach was too wide to fit through the gateway in Marble Arch and Parliament said that this was a clear example of Nash’s total incompetence. Nash – rather than the late King – was blamed for all the cost over-runs on the three projects and in 1829 the Treasury accused him of fraud. He was later exonerated but fell into deep disgrace over the financial fallout from his expensive building projects. Nash was stripped of his role as architect to the Surveyor General of Royal Parks and Chases and the controversy ensured that Nash would not receive any more official or private commissions. Nor was he awarded a long anticipated Knighthood that other contemporary architects such as Jeffrey Wyattville, John Soane and Robert Smirke received. Perhaps not surprisingly Nash had something akin to a huge nervous breakdown and retired to his home on the Isle of Wight in total disgrace and professional ruin. His health declined and by 28 March 1835 family letters described him as “very poorly and faint’. He died at his home on 13 May 1835. Perhaps feeling guilty for her role in some of his humiliations his widow Mary Anne Nash acted to clear his debts by selling his Isle of Wight home and possessions. Mary Anne then retired to a property Nash had bequeathed to her in Hampstead where she lived until her death in 1851, until the end a champion of her husband’s good name and reputation. 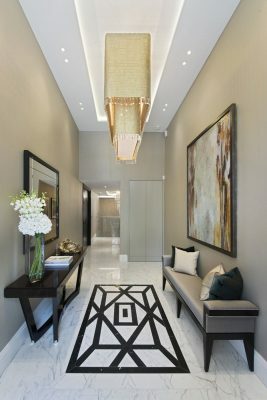 Amazon Property is an award winning investment and development group with an enviable record of success spanning all sectors of the real estate market. 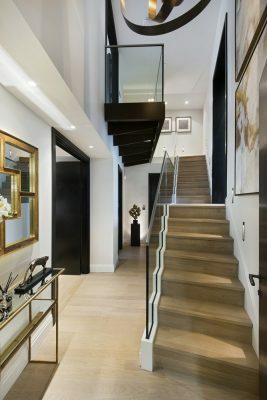 The group is most associated with the Prime Central London residential market where the company has established a strong reputation for being specialists and influential leaders within this field. 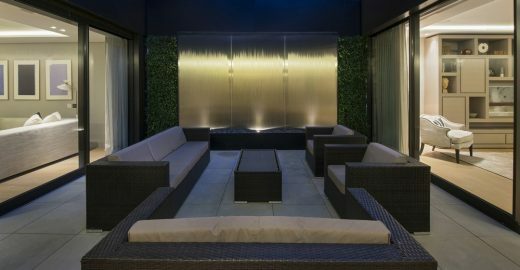 The directors have over 20 years experience in Central London projects and Amazon Property has delivered over 60 design led schemes. To date the company has acquired in excess of three million square feet of real estate assets comprising investments, developments and trading assets. Amazon Property has a current development pipeline of circa £300 million. The firm’s success is achieved by fully integrating and enhancing its investment, development and asset management and financial skills. 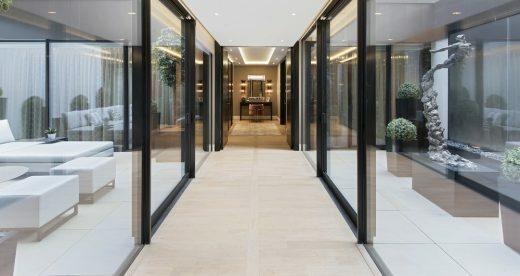 The company has the in-house skills and proven expertise to be able to undertake any sort of development and investment in Central London including the restoration and conversion of historic buildings into new luxury developments, the creation of landmark office buildings and the delivery of mixed use projects. 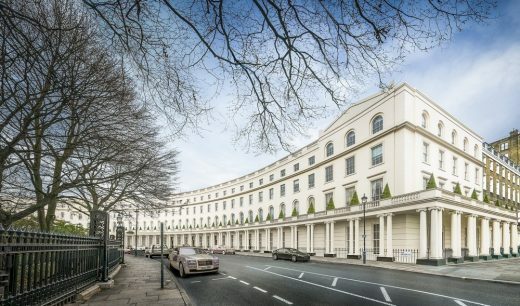 Park Crescent is at the north end of Portland Place and south of Marylebone Road in London, England. 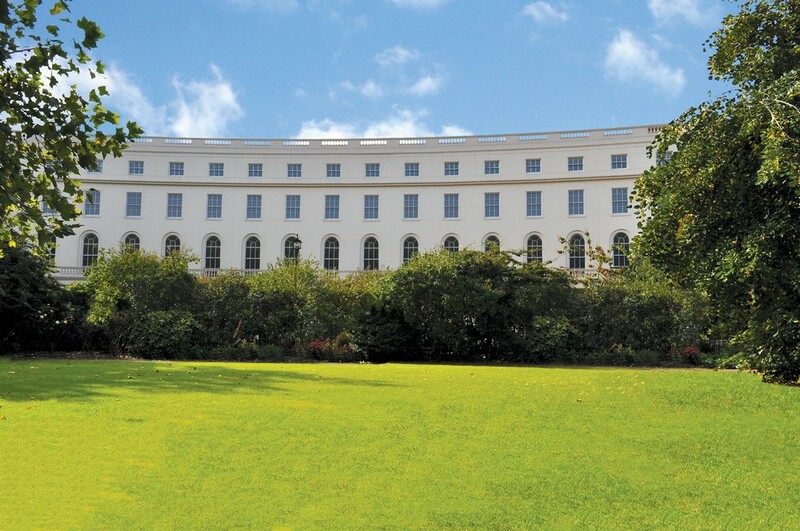 The Crescent consists of elegant stuccoed terraced houses by the architect John Nash, which form a semicircle. 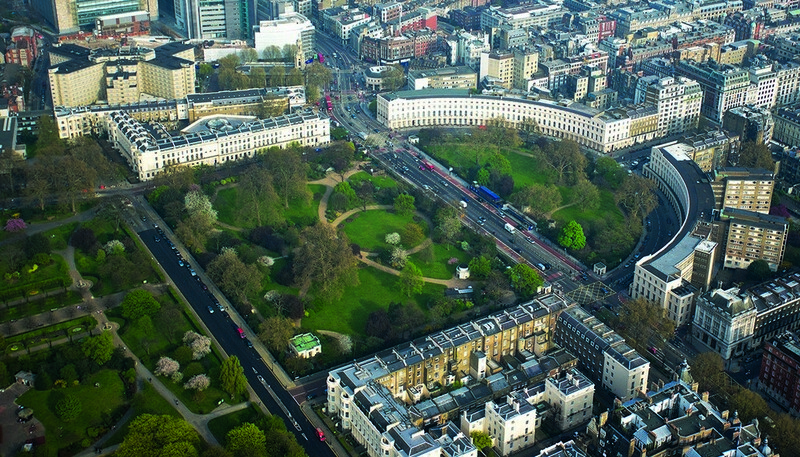 The Crescent is part of Nash’s town-planning scheme linking central London to Regent’s Park. 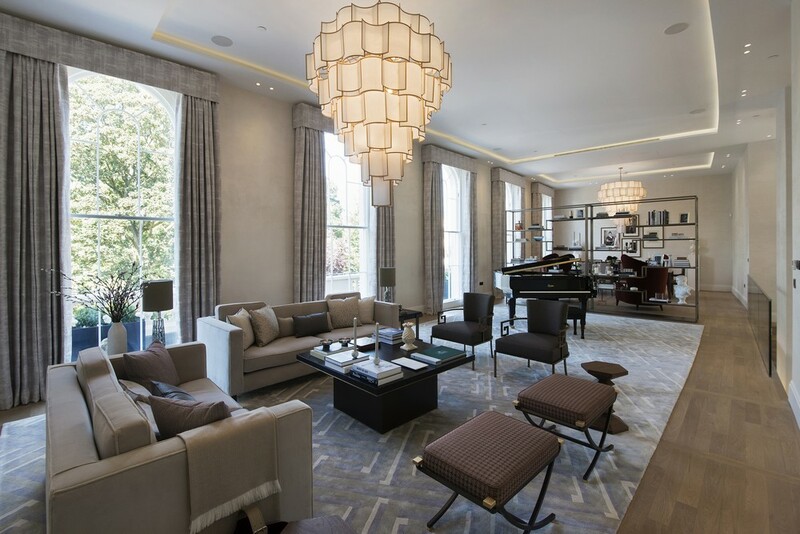 Work on the Crown Estate properties started in 1806, but the builder Charles Mayor went bankrupt after 6 houses had been built and was only completed 1819-21. The interiors of the buildings do not remain in their original condition. 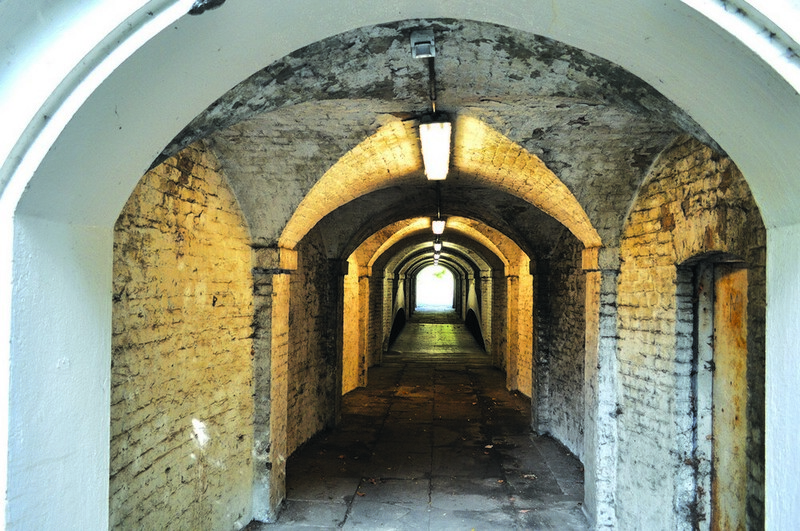 After the Second World War Park Crescent and other Nash terraces were in poor condition. The facades were restored and protected, but behind the curve of the Crescent the rest of the structures were modernised. The crescent is now the home of institutions such as International Students House, London and the Institute of Chartered Secretaries and Administrators. 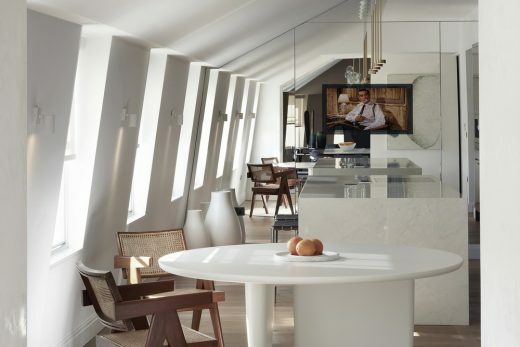 Many houses are now converted into expensive flats. Regent’s Park tube station is next to the Marylebone Road side of the garden. 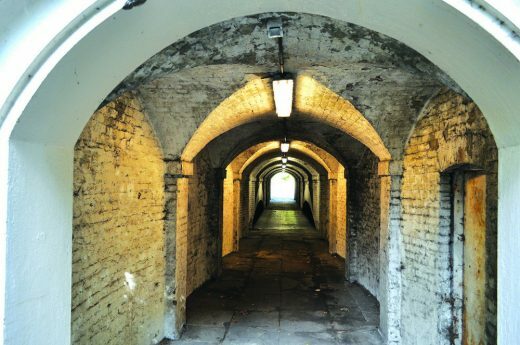 An unusual and original local feature is the “Nursemaids’ Tunnel”, an early example of an underpass, linking the gardens of Park Crescent to the gardens of Park Square on the other side of Marylebone Road.